New York, NY – Tonight the American Foundation for Equal Rights (AFER) and Broadway Impact launched the all-star Broadway premiere of “8″to a packed and enthusiastic audience. The play, which chronicles the historic trial in the federal legal challenge to California’s Proposition 8, was written by AFER Founding Board Member and Academy Award-winning writer Dustin Lance Black and directed by Tony Award-winning actor and director Joe Mantello. The production is an unprecedented account of the Federal District Court trial in Perry v. Schwarzenegger, the case filed by AFER to overturn Prop. 8, which eliminated the right of gay and lesbian couples to marry in California. Prop. 8 was ruled unconstitutional in August 2010. The premiere featured an all-star cast including Academy, Tony and four-time Emmy Award nominee Bob Balaban; Emmy and Tony Award winner and two-time Golden Globe Award nominee Ellen Barkin; acclaimed “White Collar” television star Matt Bomer; Emmy Award-winning journalist Campbell Brown; Golden Globe Award winner and four-time Emmy Award nominee Anthony Edwards; Academy and Golden Globe Award winner and Tony nominee Morgan Freeman; Tony Award nominee Jayne Houdyshell; award-winning Broadway, television and film star Cheyenne Jackson; celebrated playwright and gay rights activist Larry Kramer; Academy, Emmy and two-time Golden Globe Award winner Christine Lahti; two-time Academy Award-nominated, multiple Emmy and Golden Globe Award-winning, two-time Tony Award-winning actor John Lithgow; Tony Award nominee and Broadway Impact Co-Founder Rory O’Malley; two-time Emmy Award-winning, Academy and multiple Golden Globe-nominated director and actor Rob Reiner; Broadway star Kate Shindle; Emmy Award winner Yeardley Smith; two-time Tony Award winner Stephen Spinella; and Emmy Award winner and three-time Golden Globe Award nominee Bradley Whitford. 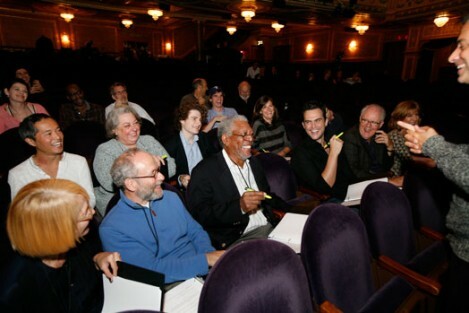 The cast of “8″ also featured Tony Award nominee K. Todd Freeman, Jay Armstrong Johnson, Ken Leung and Ben Rosenfield. The “8″premiere attracted a sell-out crowd with more than 80 people lined up outside the theatre this morning to snap up the remaining tickets; some camped out overnight. Opinion and political leaders, philanthropists, business leaders and actors turned out to support “8,” including Lieutenant Dan Choi, Chace Crawford, Anna Deavere Smith (Pulitzer Prize winner), Fran Drescher, Adrian Fenty (former Mayor of Washington DC), Celia Keenan-Bolger, Laurene Powell Jobs, Joel Klein (Executive Vice President of News Corporation), Judith Light, Dan Loeb (CEO, Third Point Capital),Sir Deryck Maughan (Partner, Kohlberg, Kravis & Roberts), Stuart Milk, Stephen Pasquale, Christine Quinn (NY City Council Speaker), Rt. Rev. Bishop V. Gene Robinson, Barbara Walters, and Brian Williams. Black, who penned the Academy Award-winning feature film Milk, based “8″ on the actual words of the trial transcripts, first-hand observations of the courtroom drama and interviews with the plaintiffs and their families. Following the New York debut on September 19th, AFER and Broadway Impact will license “8″ to schools and community organizations nationwide in order to spur action, dialogue and understanding. AFER and Broadway Impact will coordinate these staged readings across the country, so that “8″ will live on beyond its September premiere. Proceeds from tonight’s reading will go directly to the fight for full federal marriage equality and to support educational efforts toward securing the freedom to marry nationwide. Follow “8″on Twitter: @8theplay or on Facebook.